The deep rust color and sweetly fluffy texture are too scrumptious to be served only during the holiday season. 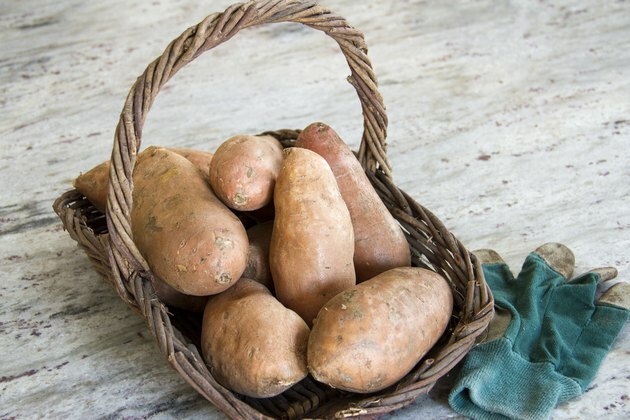 Sweet potatoes contain a large amount of starch, which must be broken down into sugar to bring out the fullness of this tuber’s distinctive flavor. While this is traditionally done in the oven, it is also possible to cook up crisp and tender sweet potatoes using only your stove top. The key is in the two-part process that brings out the best in the taste, as well as in the texture. 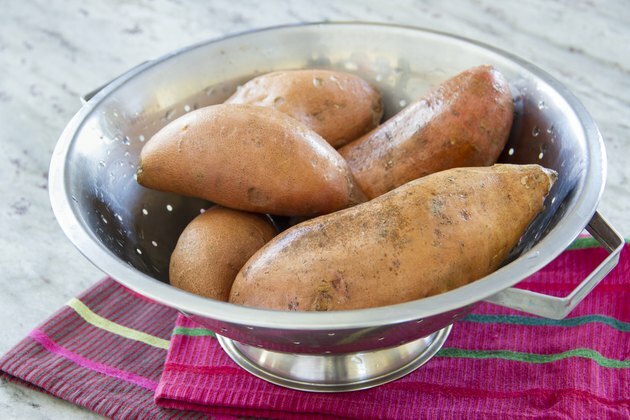 Wash your sweet potatoes thoroughly and drain them in a colander. 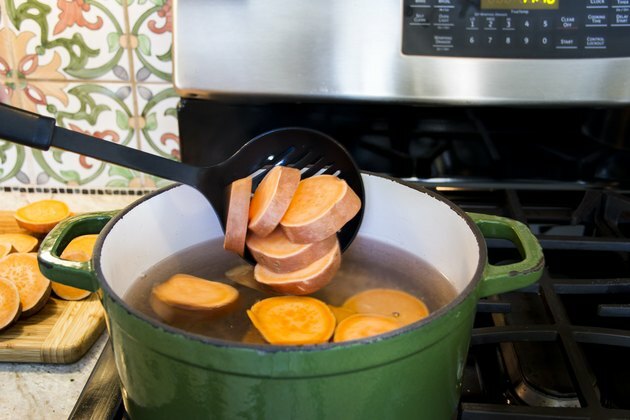 Deeper-hued sweet potatoes work better for this method of cooking than white ones, because they contain more starch. Fill a large pot half-full with water and add a generous spoonful of salt. Bring the water to a boil. Add the sliced sweet potatoes, being careful not to splash yourself. 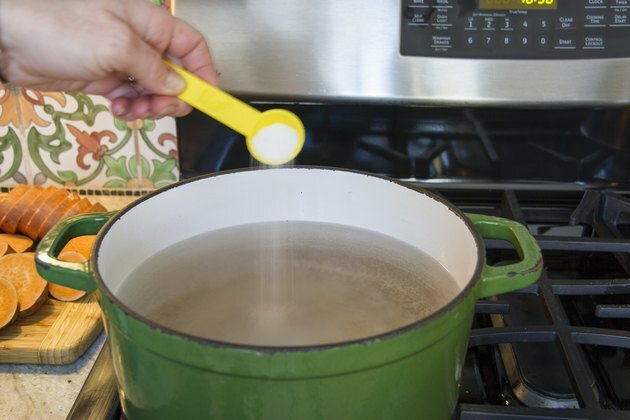 Pour in enough room-temperature water to fill the pot three-quarters of the way full and cover it. Let the potatoes sit in the hot water for about 60 minutes to soften them and let the sugar develop. You can simmer the potatoes for about 20 minutes if you are short on time, but the result may not be as crisp. 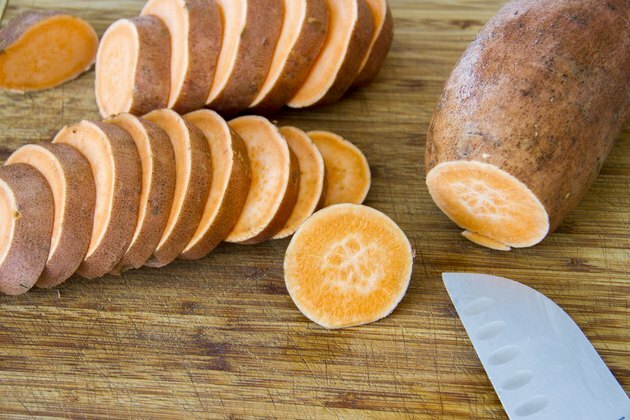 Drain the softened sweet potato slices and pat them dry with paper towels. Coat the bottom of a large, deep skillet with a thick coating of olive oil. Heat the oil over medium-high heat until its scent is noticeable and the surface of the oil seems to ripple or shimmer. 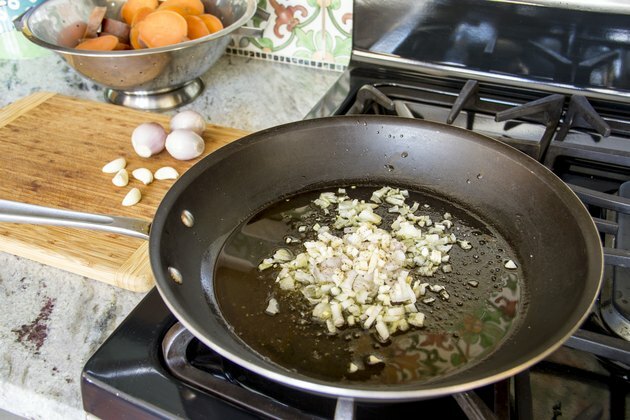 Add aromatics such as garlic and onion for a more flavorful dish, cooking them just until they are soft. Add the sliced sweet potatoes. Season them with salt, pepper and the herbs and spices of your choice. Rosemary, thyme and sage work well, but don’t be afraid to experiment. 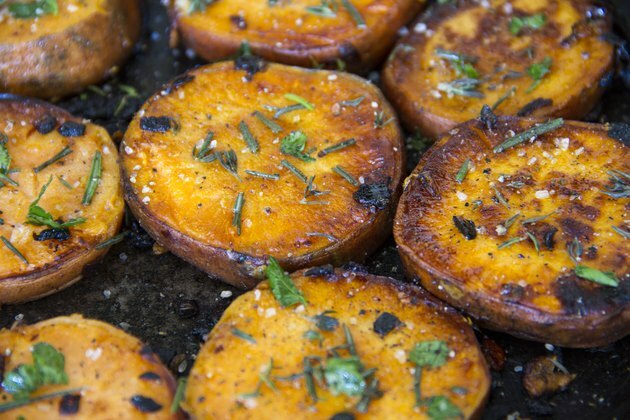 Fry the sweet potato slices, turning them frequently, until the edges begin to brown, about 10 minutes. Add chopped bacon to the olive oil and fry the sweet potatoes in the drippings with sliced mushrooms and green peppers for a quick and simple sliced potato hash. Do not boil the sweet potatoes because they will become too mushy to fry up crisply.